We’re always looking for ways to save time and money in the studio, so we set out to see if we could create a low-budget but powerful lighting solution for photography and videography. After wandering the aisles of the local hardware store, we found materials that allowed us to create our very own studio lighting hack—an 11,200 lumen light that we mounted to a light stand, and with just a few additional items, it cost less than $200. Once all the parts were back in the studio, it only took about 10 minutes to build. The high-powered LED studio light is suitable for both video or stills work. And, since it’s an LED system, it’s also lightweight, and has been pretty durable. The light we found is the Lithonia Lighting IBH 11L MVOLT 2-Feet White LED High Bay Light (it’s available on Amazon at Home Depot and other retailers). It was $156 when we bought it. The VESA light stand adapter is the Kupo Monitor Adapter KG002712 (available on Amazon and several online photo stores). It’s about $30 right now. You’ll also need a power cord to connect to the unit—we sacrificed an existing extension cord and used some of the electrical end caps we already had, but those all can be bought for less than $10. I cannot find the information that you say is available for the light. HELP!!! Hi: The notes can be found in the Comments section of the YouTube page, but we’ve also updated the post to include them here. Tried to contact the manufacturer of these panels, but my emails through their web site bounced back. I’m wondering if these panels accept both 120 volts AC and 220-240 volts AC as used in Europe. If so, this would be a brilliant (pun intended) option for overseas shoots as well as local projects. I could see rigging with a plug similar to a female computer/appliance type one that would let me have multiple power cords with the correct outlet plug at the other end and just use the one for where I’m shooting. Also could easily see rigging a daylight color correction filter to eliminate the color balanc problems mentioned in the video…thanks for the idea! Interesting. The packaging does not say that they’re 110/220, and I just searched Amazon’s UK site and while I find Lithonia fixtures, I did not find these. While I appreciate the “home brew” effort there are several points of consideration. First, the CRI of these LED’s is only in the 70-80 range according to the manufacturer. Commercial, photographic systems have a CRI of 95+. Thus, color accuracy will suffer. Additionally, these LED’s are one temperature and one temperature only. So for a few $ more, I would either seek out LED’s with better color rendering or buy a commercial system with adjustable temperature. We did mention that the color temperature on the warm side, so to use a custom white point. 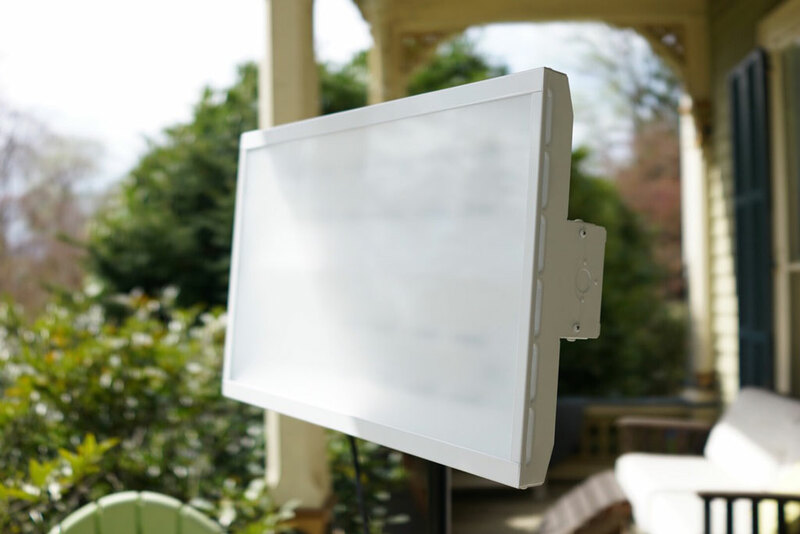 While you can get some on-camera adjustable LED panels, they’re very narrow and don’t provide as much overall coverage. Nothing saying you need to buy these panels. They’re a cheap, easy to use solution for people not looking to invest in something more expensive. Great idea. But can I use this light outside as well? Also are the LEDs replaceable should one or several of them bad? They’re rated for use in damp environments, but there is nothing protecting the electronics. I wouldn’t use outside. The LEDs are hard wired to the case, but they’ll have a lifespan probably in the years.